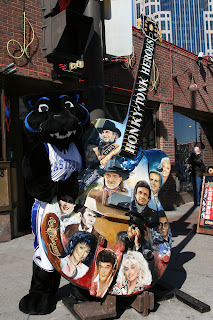 Billy Panther hit the Nashville streets early on Friday morning as he was awake and in the newly named Bridgestone Arena for both the EIU women's and men's basketball shoot arounds this morning. On the way to the Arena he made a quick photo op stop at the corner of Broadway where many of the Nashville Music joints are located. Billy watched EIU's women's team pick up a hard fought 65-51 win over UT Martin as they advanced to their third straight OVC Conference Championship game. EIU will play Austin Peay for the second straight season with hopes that the NCAA theme song One Shining Moment is playing following Saturday's 3 p.m. showdown instead of Last Train To Clarksville. Tune in later today for Billy's adventure for the men's game versus Murray State.